Shady Oaks is situated on 25 sun-drenched acres in Ocala's horse country. The sprawling property offers two barns totaling 20 stalls with feed and tack rooms, eight four-board fenced paddocks, a roundpen, jump fields, and a spacious equipment barn with a paved parking area. The property has three RV parking areas with 30/50 amp service. The main barn features a luxurious apartment with ample living areas, full eat-in kitchen, one full bath, and two half baths. Property hosts a spring fed pond stocked with brim and big mouth bass, perfect for an afternoon of fishing. 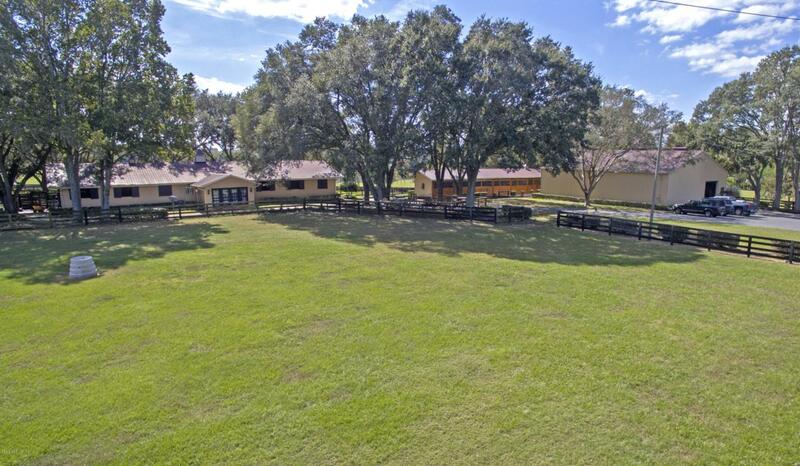 Shady Oaks is located within 10 minutes of the World Equestrian Center, 15 minutes from HITS, 20 minutes from downtown Ocala, and 30 minutes from downtown Gainesville making this perfect training facility. Listing provided courtesy of Carl Harnish of Showcase Properties Of Central Fl.